All in a doctor’s day…. Saw my very last patient at 7.45am. I was supposed to finish work at 8am having worked overnight. I am tidying up when another name pops on the screen. It is a young girl in her early 20s with painful period. That should be easy, I think as I call her through, already dreaming of my warm bed. So she tells her story of having a really painful period past three days. Both paracetamol and ibuprofen haven’t helped. So I asked all the usual questions and then requested her to lie on the couch for examination. Now this lady is big. However when she lay down, her tummy was BIG. Very Big! I placed my hand on it and looked at her. ‘Did you say you are on your period?’ I asked. ‘I think you are in labour,’ I replied. But a urine test confirmed she was indeed pregnant. She was adamant that she didn’t know. ‘We need to get you to the labour ward’ I said gently. She was here studying. Her parents were across the globe in the US. She wasnt keen to call anyone. I contacted labour ward and sent her over. Fast forward 24 hours later, I call her to see how she is doing. ‘I have had my wee girl. It’s the cutest baby ever’, her voice tinkled down the phone. I was genuinely happy for her. Her flat mate was with her and her mum was on her way over to meet her unexpected grandchild. I smiled as we chatted. Forget UNI for the moment. Forget how she was going to cope. Forget all the upheavals this lovely addition to the world may bring. It was heartwarming to know mother and child were both well despite not having any antenatal attention, no pregnancy vitamins, no preparation at all for its arrival. It’s one day at a time. Super Health For you starts today!! Remember to join me on the health webinar today. Its packed full of information to ensure you finish 2016 on a healthy note. Plus – for attending the Super Health webinar, you get my eBook titled ‘Three things that are killing our children.’ Find out why the statistics show that our children may live 10 years shorter life spans than we do now. Questions are already coming in, so log in and you can post your health related questions even before the webinar starts!! Please share with your loved ones so they can benefit too. I look forward to ‘seeing’ you on the webinar. ps: Click Here to secure your place. Fed up of horrible skin? Confused about what a healthy meal really is? Wishing you had a personal physician to decode it all? My new (free) Health Webinar is what you need!!! My simple, powerful and easy-to-implement tips will completely RESET your health. The health webinar will be LIVE on Tuesday 4th October 8pm. The session will last approximately 35 minutes.. I am going to help you ensure that you end 2016 on the perfect note health-wise. PLUS at the end of the session you’ll also receive my FREE eBook ‘Three things that are killing our children’. If you are a parent or have a niece or nephew, you NEED to read this! Having been a doctor for nearly 20 years, I am deeply saddened that a lot of illnesses are the result of ignorance and I am on a mission to CHANGE that. My passion is health and this webinar is packaged to help you through the maze of conflicting information out there and help you on the road to great health. So we woke up that morning in the hotel. We were attending a program together. We were also on a squat challenge… along with more than 100 women who were with us on our ‘Whatsapp’ healthy lifestyle group. I think the challenge for the day was to do 120 squats. I recall getting to 80 and wanting to stop. I looked over to Nkem and she was still going on her squats with no sign of stopping. I said to myself, ‘If she can do the challenge despite her diagnosis, I too can.’ So I carried on with my squats. And we completed the squats challenge for the day. I remember saying to myself that if Nkem wasn’t here, I probably would have deferred the remaining 40 squats to evening and by evening, I might have forgotten due to the business of life and end up not completing my squats. You see Nkem was like that…. She swept you along with her strength. When you were with her, you believed you could do ANYTHING!! As time went on, I knew she was often in pain. I would glance across the table at her or watch her from the corner of my eye and marvel at how she could keep such a straight face despite what was going on in her body. 5 years ago diagnosed with the most aggressive form of cancer. She fought it. She gave it her best shot. She truly believed she would pull through. She wanted her story to encourage the millions of people out there suffering from cancer. She went to the wards and told other cancer sufferers ‘Look at me!! I was diagnosed with cancer more advanced than yours so please believe you will pull through.’ She spread light and hope through the wards. ‘I see why people die, Ada’ she once said to me, ‘The pain is so bad…so bad…that the person just decides “Right I have had enough” and they give up and die.’ I know she was close to that several times. But she stayed strong. She did her best. Her legacy lives on. If you are serious about your health please register NOW! Webinar holds on the 4th of October at 8pm GMT. Listen from the comfort of your home. 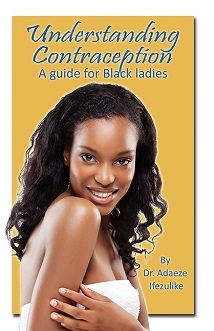 Get tips that would revolutionize your health. Stay informed by registering NOW. Spaces are limited as I like to keep things small and cosy. Plus you get a FREE eBook that would blow your mind when you attend the webinar. Learn why our children are estimated to live atleast 10 years shorter than us. Claim your spot for the webinar here. To know the exact amount you should drink, multiply your weight by 33mls eg if you weigh 100kg then you should be drinking 3.3litres per day. And if you struggle to drink water, try taking it flavoured with bits of fruits. Make your own home flavoured water….much healthier than chemical-filled shop ones. I’ve had 1 litre so far (10am) so feeling pretty pleased with myself…hahaha. Choosing to be THANKFUL that checks are being made to keep us all safe from terrorists and other disgruntled and crazy folks out there. 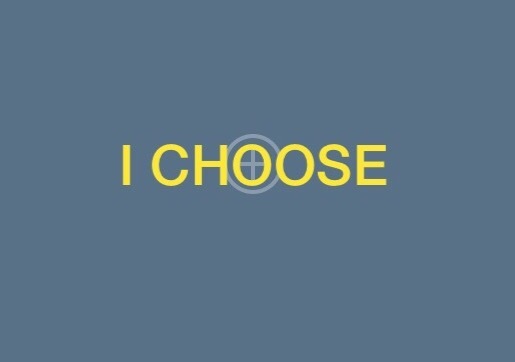 I have the power to CHOOSE how I FEEL and REACT! 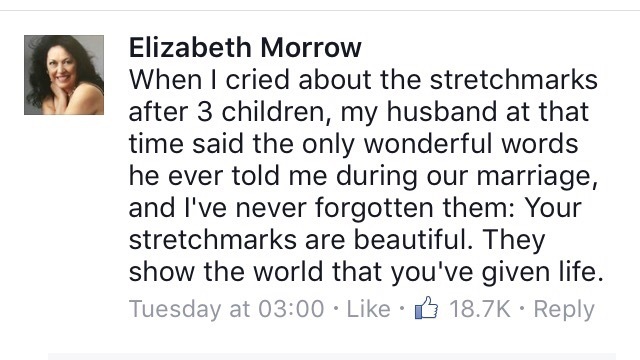 Sharing it with you out there who is unhappy with your stretchmarks. They are evidence that you participated in creating life!!! Be the best you. Looking forward to the weekend. Don’t be so busy saving the world that you don’t take care of you. 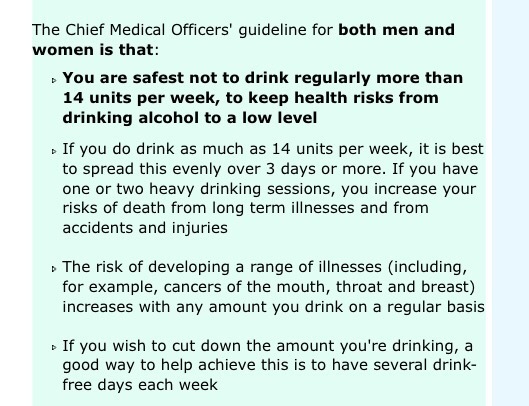 We should all definitely drink less!! Lifestyle changes remain key in stopping a lot of the illnesses that are on the increase worldwide. What will it take for you to reduce your drinking or even stop altogether? 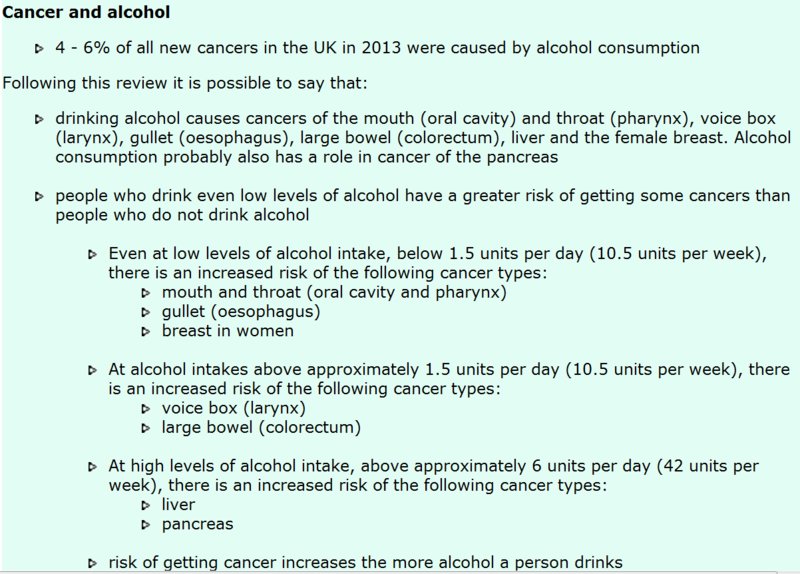 The Chief Medical Officer of UK has issued new guidelines on alcohol and the diseases it can cause. 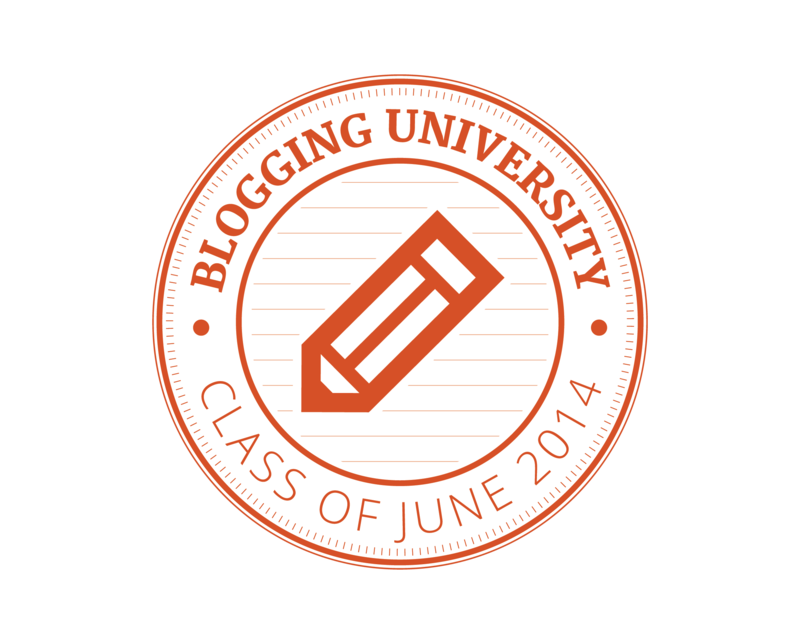 Thank you for reading my blog posts. 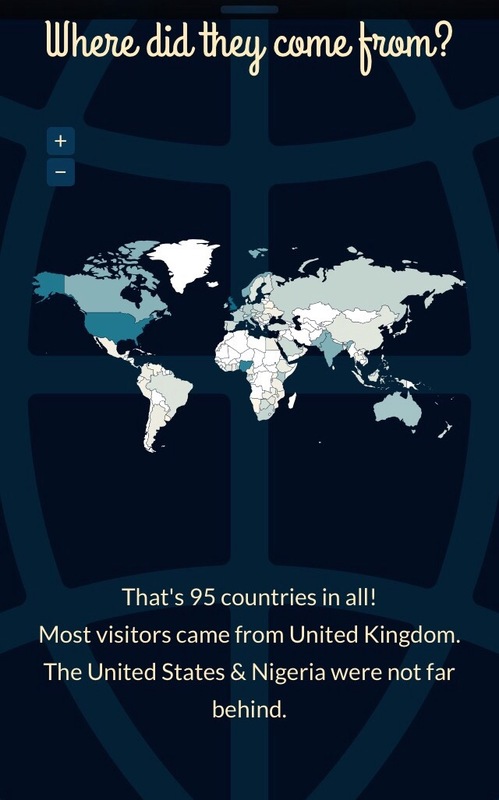 Wordpress has kindly informed me that in 2015 people reading my blog came from…..95 countries!!!! Hoping to have even greater and higher quality content for you this 2016.